Wrens and Tree Swallows notwithstanding The bird most sought after by residents of both towns and farms alike is the Purple Martin. It is one of the few birds that nests in colonies which endears it to people. (See Article No. 9). Although Purple Martins used to nest singly (in pairs) in abandoned woodpecker holes they do like to nest in colonies if at all possible. In this respect they have been well aided by man and man alone – a welcome change from the doom and gloom of the negative effects of human activities on wildlife. This was first done by the native inhabitants of the southern USA and Mexico by putting out groups of gourds suspended from a snag or on a pole. Modern man has substantially improvised on the quality and quantity of housing available for the Purple Martin. The most common is the multiroom birdhouse ranging from fewer than six rooms to more than fifty, although, twelve and sixteen are the most common. To make one of these houses takes a good bit of building skill and even more patience. Fortunately, there are many commercial ones available. 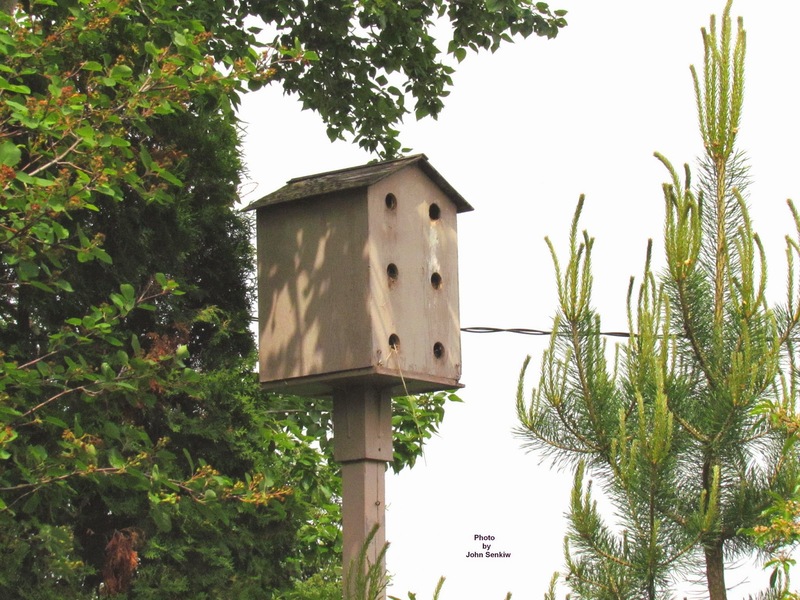 Depending on the materials used and the amount of ornateness, a 16 room birdhouse can be had for as little as $30.00 to well over a $1000.00. The cheaper ones are usually made of aluminum or plastic; the more expensive ones are made of wood with fancy trim made of various coloured metals. Another effective system is to hang several single room birdhouses in a group from a pole fitted with several cross arms from which to hang the houses. Gourds (a type of pumpkin) can also be used but they do not grow in Canada so are more or less restricted to the southern USA and Mexico. Because these single dwellings are hung on a short chain or wire they will swing a bit in a wind. 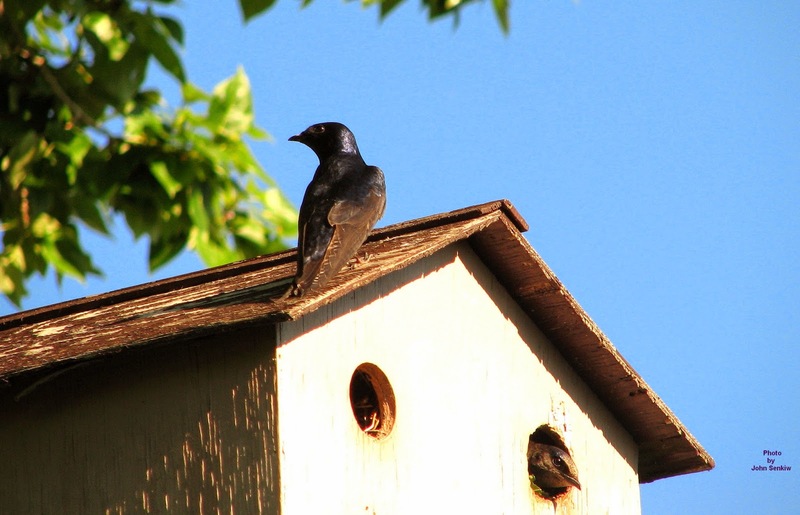 Like Tree Swallows, Purple Martins do not mind a moving birdhouse but House Sparrows and Starlings do not and avoid them. Another great advantage of this system is that the number of houses can be increased or reduced as the need arises. It is also easier to replace or repair a one room house than a multiunit one. This system of many single houses suspended in close proximity to one anther is gaining in popularity. The size of the “living room” of the house should be about 8in. by 8in. by 6in. high. The entrance should be about 2in. in diameter and positioned about one inch above the floor. Perches are an option but not required. However, a TV antenna type of perch mounted on top of the pole seems to be greatly appreciated by the martins that do like to perch high up. In fact a discarded TV antenna would work very well and can stand up to some very severe weather. The houses should be out in the open away from trees. Then, one can only wait and hope. We were lucky as we had a colony move within days of putting up our 12 room house (this week’s picture); others have waited for years and sometimes even then with no results. Such is the way of Purple Martins. If this is your first attempt, good luck with your forays into the world of Purple Martins.